This is a revised version of n1550=03-0133, which was accepted for Technical Report 1 by the C++ standard committee's library working group. This proposal is a revision of paper n1297, n1477, and n1531. We propose a new system of iterator concepts that treat access and positioning independently. This allows the concepts to more closely match the requirements of algorithms and provides better categorizations of iterators that are used in practice. This proposal for TR1 is a pure extension. Further, the new iterator concepts are backward-compatible with the old iterator requirements, and old iterators are forward-compatible with the new iterator concepts. That is to say, iterators that satisfy the old requirements also satisfy appropriate concepts in the new system, and iterators modeling the new concepts will automatically satisfy the appropriate old requirements. The algorithms in the standard library could benefit from the new iterator concepts because the new concepts provide a more accurate way to express their type requirements. The result is algorithms that are usable in more situations and have fewer type requirements. For the next working paper (but not for TR1), the committee should consider the following changes to the type requirements of algorithms. These changes are phrased as textual substitutions, listing the algorithms to which each textual substitution applies. This proposal also includes a concept for specifying when an iterator is interoperable with another iterator, in the sense that int* is interoperable with int const*. Like the old iterator requirements, we provide tags for purposes of dispatching based on the traversal concepts. The tags are related via inheritance so that a tag is convertible to another tag if the concept associated with the first tag is a refinement of the second tag. Our design reuses iterator_traits<Iter>::iterator_category to indicate an iterator's traversal capability. To specify capabilities not captured by any old-style iterator category, an iterator designer can use an iterator_category type that is convertible to both the the most-derived old iterator category tag which fits, and the appropriate new iterator traversal tag. We do not provide tags for the purposes of dispatching based on the access concepts, in part because we could not find a way to automatically infer the right access tags for old-style iterators. An iterator's writability may be dependent on the assignability of its value_type and there's no known way to detect whether an arbitrary type is assignable. Fortunately, the need for dispatching based on access capability is not as great as the need for dispatching based on traversal capability. A difficult design decision concerned the operator. The direct approach for specifying operator would have a return type of reference; the same as operator*. However, going in this direction would mean that an iterator satisfying the old Random Access Iterator requirements would not necessarily be a model of Readable or Writable Lvalue Iterator. Instead we have chosen a design that matches the preferred resolution of issue 299: operator is only required to return something convertible to the value_type (for a Readable Iterator), and is required to support assignment i[n] = t (for a Writable Iterator). In the tables below, X is an iterator type, a is a constant object of type X, R is std::iterator_traits<X>::reference, T is std::iterator_traits<X>::value_type, and v is a constant object of type T.
A class or built-in type X models the Readable Iterator concept for value type T if, in addition to X being Assignable and Copy Constructible, the following expressions are valid and respect the stated semantics. U is the type of any specified member of type T.
a->m U& pre: pre: (*a).m is well-defined. Equivalent to (*a).m. A class or built-in type X models the Writable Iterator concept if, in addition to X being Copy Constructible, the following expressions are valid and respect the stated semantics. Writable Iterators have an associated set of value types. A class or built-in type X models the Swappable Iterator concept if, in addition to X being Copy Constructible, the following expressions are valid and respect the stated semantics. The Lvalue Iterator concept adds the requirement that the return type of operator* type be a reference to the value type of the iterator. *a T& T is cv iterator_traits<X>::value_type where cv is an optional cv-qualification. pre: a is dereferenceable. If X is a Writable Iterator then a == b if and only if *a is the same object as *b. If X is a Readable Iterator then a == b implies *a is the same object as *b. A class or built-in type X models the Incrementable Iterator concept if, in addition to X being Assignable and Copy Constructible, the following expressions are valid and respect the stated semantics. If X is a Writable Iterator then X a(r++); is equivalent to X a(r); ++r; and *r++ = o is equivalent to *r = o; ++r. If X is a Readable Iterator then T z(*r++); is equivalent to T z(*r); ++r;. A class or built-in type X models the Forward Traversal Iterator concept if, in addition to X meeting the requirements of Default Constructible and Single Pass Iterator, the following expressions are valid and respect the stated semantics. 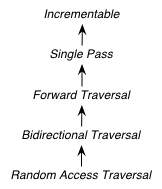 A class or built-in type X models the Bidirectional Traversal Iterator concept if, in addition to X meeting the requirements of Forward Traversal Iterator, the following expressions are valid and respect the stated semantics. pre: there exists s such that r == ++s. post: s is dereferenceable. ++(--r) == r. --r == --s implies r == s. &r == &--r.
A class or built-in type X that models Single Pass Iterator is interoperable with a class or built-in type Y that also models Single Pass Iterator if the following expressions are valid and respect the stated semantics. In the tables below, x is an object of type X, y is an object of type Y, Distance is iterator_traits<Y>::difference_type, and n represents a constant object of type Distance. x == y convertible to bool == is an equivalence relation over its domain. y == x convertible to bool == is an equivalence relation over its domain. x != y convertible to bool bool(a==b) != bool(a!=b) over its domain. y != x convertible to bool bool(a==b) != bool(a!=b) over its domain. If X and Y both model Random Access Traversal Iterator then the following additional requirements must be met. y - x Distance distance(Y(x),y) pre: there exists a value n of Distance such that x + n == y. y == x + (y - x). x - y Distance distance(y,Y(x)) pre: there exists a value n of Distance such that y + n == x. x == y + (x - y). The is_readable_iterator class template satisfies the UnaryTypeTrait requirements. Given an iterator type X, is_readable_iterator<X>::value yields true if, for an object a of type X, *a is convertible to iterator_traits<X>::value_type, and false otherwise. The UnaryTypeTrait concept is defined in n1519; the LWG is considering adding the requirement that specializations are derived from their nested ::type.